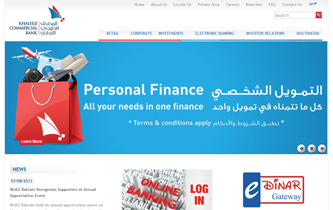 Khaleeji Commercial Bank has launched a new website using eBuilderCMS.Net. Khaleeji Commercial Bank announces the launch of its new website http://www.khcbonline.com/, designed with a fresh user-friendly experience and impactful presentation of information regarding its products and solutions. The adaption of eBuilderCMS.Net as a platform for its website gives business users the ability to manage and publish website contents with out the help of technical users.The new website is available in both English and Arabic languages.